Melanie McGee joined us from out west just a few months ago with more than 8 years experience in the industry. The highlight of her time with us thus far has been the opportunity to meet so many new people and get to know the community she's beginning to call home. In her down time, Melanie enjoys searching for sea glass on the shoreline. Her new home here on the east coast came with some land, so Melanie is begrudgingly learning to love gardening. Ashley McSorley began her career with us in 2014, bringing with her 4 years of experience in the insurance industry. Ashley enjoys her position here for many reasons, like the co-workers, environment, and clients, but also for the delicious cakes we've recently begun serving on employee birthdays. Ashley is an avid sports fan. She's a lifelong Yankees fan when it comes to baseball, and an Ottawa Senators fan during hockey season. Linda Moore began her career with Guy R Day in 2012. Her favourite aspect of the job is meeting new people, catching up with old friends, and interacting with our clients. Linda can be found square dancing every Friday night. Mary Jane Mosher began working with us in 2008. Mary Jane loves working here for the collaborative environment, but also for the hours of operation. With previous experience in shift work, Mary Jane loves having evenings and weekends to relax with her family. For many years, Mary Jane has watched and longed for wild turkeys. She has settled for raising 3 free range chickens instead. Lyn Ross brings with her 18 years of insurance history as she returns to us after a 5 year period out west. The atmosphere and camaraderie our office offers enticed Lyn to come back home... that and her first grandchild! Lyn loves board games, and is the reigning cribbage champion in her home. Ginette Richard began work with Guy R Day in 1999, bringing with her 10 years of experience. Her love of antique and unique vehicles drove her into the field, and makes her time with us particularly special. In her spare time, Ginette can be found searching for the best deal on the cutest pair of shoes. She estimates that she has more than 100 pairs in constant rotation. Tricia Richardson joined our team just a few months ago. She can still be spotted at the vet clinic where she works part-time as a veterinary technician. Tricia enjoys encouraging customers to see the positive side of things. Regardless the situation, she tries to brighten client's days with a smile and a positive comment. Tricia's attitude towards helping others has been developed through her 17 years as a volunteer firefighter. Dawne Scott joined Guy R Day in 2014 when we purchased Max Hayre Insurance. Before that, she had worked in the industry for 6 years. Dawne loves how every day at Guy R Day is different. No two clients, phone calls, or meetings are the same; so everyday is fresh and exciting. Dawne has an avid sweet tooth and, when asked about this, said "I've never met a cake I didn't like". Susan Stevenson joined Guy R Day in 2014 when we purchased Olmstead Insurance. Before that, Susan had worked with them for more than 36 years. Susan especially loves the atmosphere at Guy R Day; where staff and clients are more like friends than coworkers and customers. In her down time, Susan can be found cruising around on her Harley Davidson Ultra Classic. 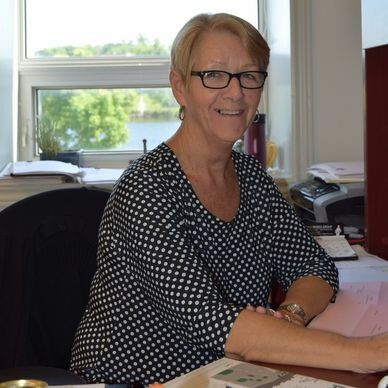 Cindy Ganong joined Guy R Day in May of 2018. She brings with her 30+ years of working in various aspects of the public. Her favourite part of working here is the “sense of family” that she has felt among her colleagues since the very first day. Cindy is currently in training and studying to become an insurance broker, and looks forward to helping her clients with all of their insurance needs. When she’s not working, Cindy loves relaxing, binge-watching Netflix, shopping, eating & spending time with her family. Jeremy is a member of the Impact Wealth team who specializes in ensuring you and your family have the right protection for life's unexpected events. Impact Wealth offers leading life, health, disability and critical illness insurance solutions. With office hours at Guy R Day each week, Jeremy is happy to meet with you to provide a complimentary review of your personal insurance. Contact our office today to schedule an appointment. Cindy Daigle started her career with Guy R Day in 1984 as a travel agent. Cindy's favourite part of working with us is interacting with the public. She describes herself as a "people person" and loves getting to know both new and existing clients. Cindy is passionate about travel. Just this year she has visited Cuba, Hawaii, the Caribbean, and has an upcoming trip to the Yukon.